If you're anything like me, a good brew first thing in the morning is your staple. When the kids have had me up throughout the night or woken me before dawn I don't think I can function until I've had that first hot cup. Unfortunately I am not a coffee fan. I've tried it several times but I just don't like it, which is a shame as I could often do with the caffeine! Mr H is a coffee drinker though, and I often think it has a lovely, homely smell. Shame about my dislike for the taste! Gourmesso make alternative Espresso Capsules for Nespresso Machines - if you've ever heard of these machines they are the ultimate gadget for coffee lovers. My sister-in-law has one and has converted my in-laws to them also. The range of coffees on offer for these capsules is epic and you can any kind of coffee you can think of. Gourmesso provide high quality coffee, made of the finest Arabica and Robusta beans from around the world, offered at a price a price unmatched by any of the other companies on the market. 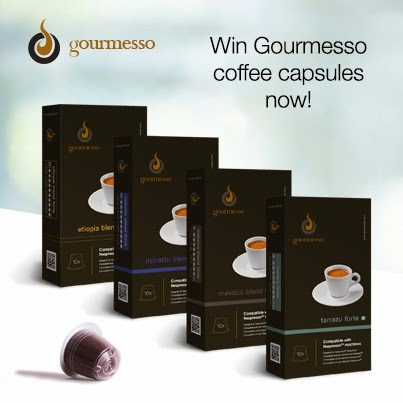 This way Gourmesso provides its consumers with a high end product at a price up to 30% lower than the original Nespresso capsules. They offer 16 different flavour blends including espresso, lungo and flavoured capsules. They have very kindly offered one Hollybobbs reader the chance to win two boxes of coffee, which is 20 capsules, in your choice of flavours. All you have to do is follow the Rafflecopter below. Good luck! Being In A Relationship Can Save You Money!